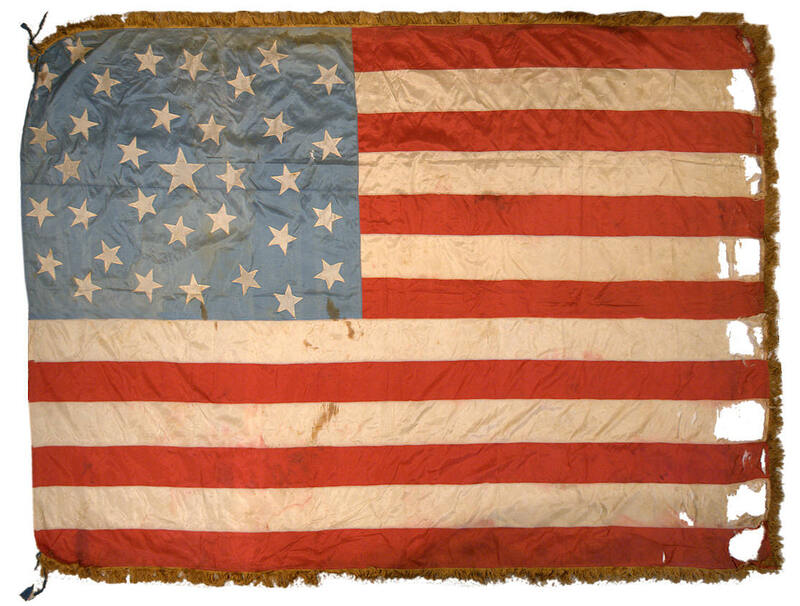 Civil War period flags are among the most sought after in all of flag collecting. Occasionally, as in the case of this flag, specific provenance for the flag is lost in time, as the flag passes down through families and generation after generation, families expand and move apart. Although a flag's specific provenance may not always be known, by examining the construction and with knowledge about the history of flags, it's possible to ascertain, with a reasonable degree of certainty, why a flag was made and how it was used. Such is the case with this flag. In all likelihood, this flag was a Union company presentation color, made and presented to a Union company at the outset of the Civil War when they mustered into service. The 34 stars on this flag are formed into a beautiful double medallion pattern, with three stars in each corner, forming a parenthesis around the circular medallions. The star count is consistent with a presentation color made at the outset of the Civil War, circa 1861. The entire flag is constructed of silk, which is the preferred material for a military grade battle flag, and the fine silk gold fringe that borders the flag is yet another precise feature of a flag made for military use. The size and proportions of the flag are also approximately correct for a company grade flag, and the silk ties on the corners, which appear to have become separated and re-tied at some point, are also found on silk battle flags of the period. Some of the stars of the flag have arms that have lifted from the blue field, and it's apparent that, on both sides of the flag, the blue under the stars is a shade dark than the rest of the field, indicating that the flag received sunlight on both sides, resulting in even fading. 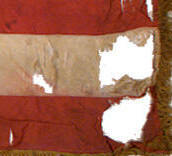 This, along with the apparent wear on the fly end of the flag, is evidence that the flag was not only presented to, but also flown by, the receiving unit. The flag descended in the family of Mr. Mark Alexander, having passed down through his father, Mr. Raymond D. Alexander, who served as a sergeant in the U.S. Army's 41st Division in World War II, from his grandfather, Mr. Glen Alexander, who served in World War I. 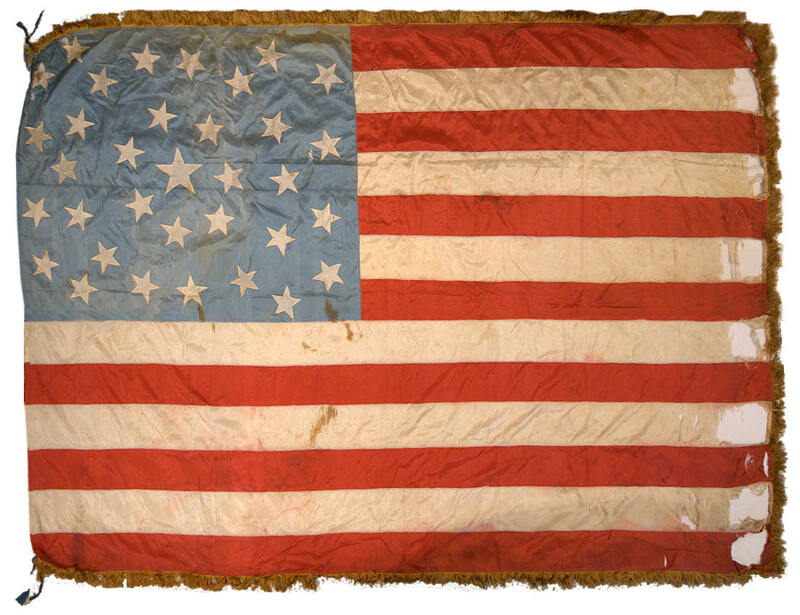 Beyond this point, the flag's chain of descent is not yet known, but with diligence and time, it may be possible to trace the flag back to its owner and possibly to the unit that once carried it in the Civil War. Regardless of its specific history, the flag is an exceptionally rare example of high quality flag making in the mid-19th century. With its beautiful sky blue field, unique medallion pattern, fine silk fringe and vibrant red and white silk stripes, the flag is a rare survivor of the great struggle to preserve the Union.